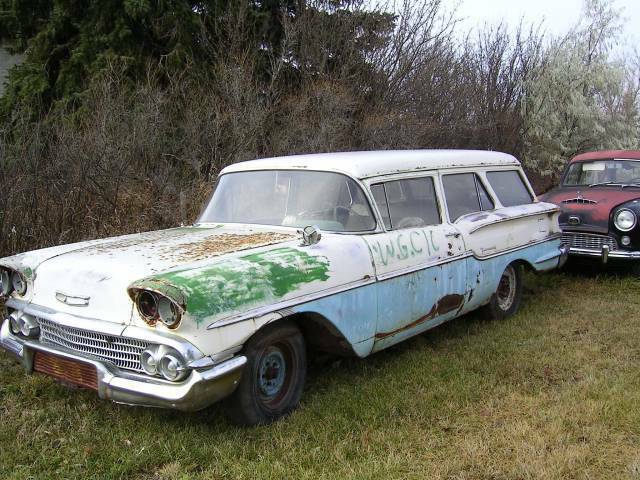 1958 Chevy Wagon Photo Picture Classic Cars for sale & Classifieds - Buy Sell Classic Car & Classic Truck Classifieds. Incredible car! i wish I had one of these! whats that in the back...a little Morris or somtething....? "yoh"man this car is cool! I'd love to restore/Hotrod that baby!! Please somebody find this car and save it....PLEASE. The '58 chevy is a beauty, I say, drop in a big block, put on some Nomad emblems and go crusin'. And just smile when people take a second look. I will never understand why these people allow this to happen. There is a bailbonds company that used to have one of these. They had it painted white with mirror tint..it was bad! ohh man,I agree with panelguy. crusing..?..I fink maebee theyres somfing wronge wiff da softwhere on this sight cause I no how two spel ok..?...or am eye going dislecksick...? This baby should be crusing....!!! all I can say is....sweeeeeeeeeeeet!! was the Yeoman a Canadian chevy wagon? That's got to be rarer than hen's teeth. It'a a two-door!